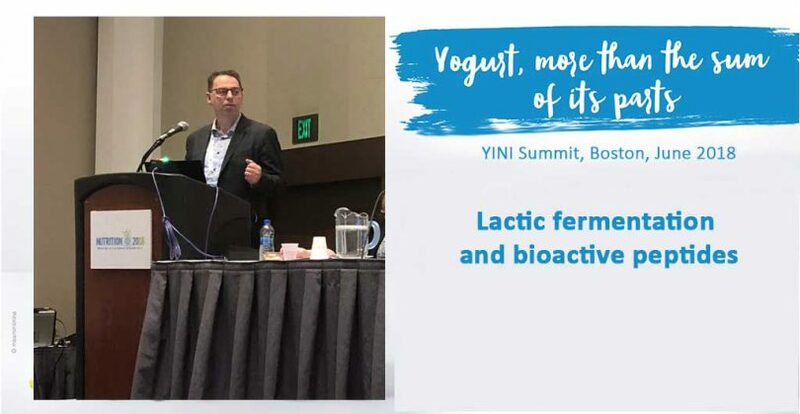 The last YINI Summit “Yogurt, more than the sum of its parts” was held on Boston on 10th June 2018 as part of Nutrition 2018. This scientific symposium gathered together renowned nutrition scientists to discuss the role of the yogurt dairy matrix. Anne Guzman reports for us the presentation made by Pr. André Marette (Laval University, Canada) about lactic fermentation, bioactive peptides and health effects of yogurt. Epidemiological studies suggest that yogurt consumption is strongly associated with better lifestyle, diet quality, sleep, healthier dieting behaviours and improved cardiometabolic health particularly with a reduced risk of type 2 diabetes, obesity and cardiovascular diseases. For these reasons, it is not a simple task to separate out the benefits of yogurt from all the other accompanying healthy lifestyle choices this group of the population makes. 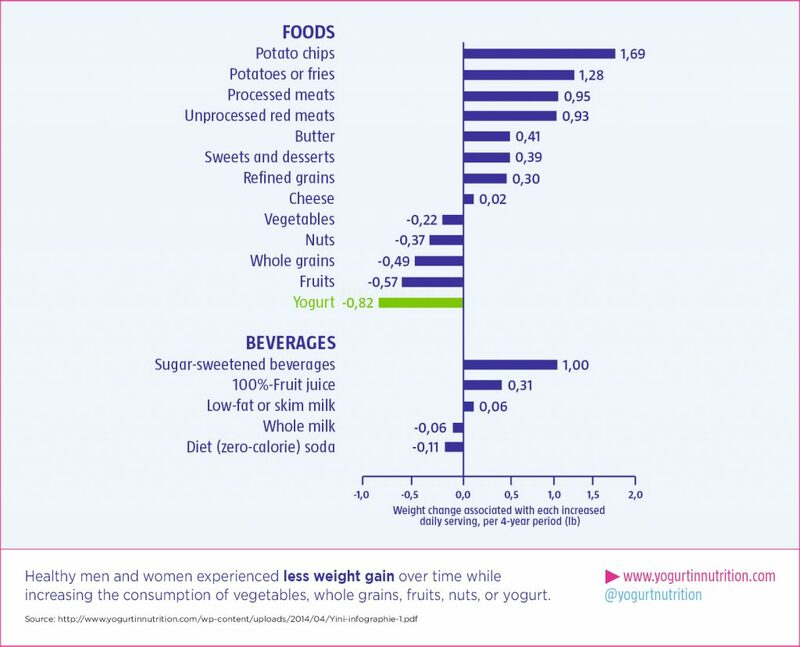 As the Professor Marette points out, more studies are required to prove a “cause and effect” for the benefits of yogurt. Regardless, the overall correlations are encouraging and despite the lack of concrete evidence we should remember “absence of proof does not equal proof of absence”. Globally, obesity and type 2 diabetes are reaching levels of epidemic proportions with diet and lifestyle factors being large contributors to both conditions. Although to date, there are no randomized controlled trials to determine a causal link between yogurt consumption and decreased rates of type 2 diabetes, several meta-analysis have consistently shown an inverse association between yogurt consumption and type 2 diabetes. The Nurses’ Health Study demonstrates a strong relationship between dietary intakes of red meat, sweets, sugar sweetened beverages, chips and weight gain. Conversely, consumption of fruits, vegetables, whole grains, milk and yogurt lead to weight loss. Yogurt eaters have healthier habits overall, which could impact the frequency of diabetes in the yogurt eating population. By choosing yogurt in the diet, people may have more satiety, improved calcium and bone health, improved weight management and may be more likely to consume nutrient dense snacks; replacing calorie dense, nutrient poor alternatives. All of these factors together will have impacts on general health that cannot be ignored. Small consistent dietary changes can have significant health outcomes. Fermentation of food has a long history, however recently more attention has been given to it in the health food industry. a healthier gut environment including increased prebiotic concentrations in the gut. In mice model studies, depending on the type of dairy consumed, there are different metabolic impacts on glucose and lipid metabolism. When comparing dairy products, the fermented peptides, and yogurt peptides in particular, exert the largest impact in regards to cardio metabolic and anti-inflammatory effects. It’s been demonstrated that an imbalance in the microbiota, or dysbiosis, of diet-induced obese and pre-diabetic mice can be reversed to normalcy through consumption of fermented dairy products, especially yogurt derived peptides. Further trials would be needed to determine if this phenomenon would be transferable to the human population. The observations noted in this research may explain some of the mechanisms that give yogurt its strong association with improved cardiometabolic health and associated conditions such as obesity. Future research in the field will focus on in vitro, animal models and human research. In humans, much needed randomized placebo controlled trials will aim to research the effect of yogurt consumption on satiety, weight gain, insulin resistance, lipid profiles, type 2 diabetes, cardiovascular risk factors, intestinal microbiota and other cardiometabolic diseases. More trials are needed to remove the confounding factors affecting yogurt’s impacts on metabolic syndrome. We can imagine a lengthy trial will be required to single out yogurts beneficial effects from all the other associated good habits that yogurt eaters appear to have. 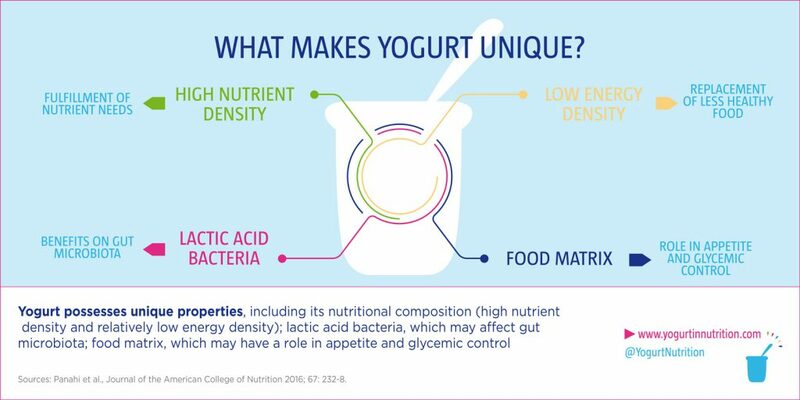 Populations consuming yogurt have healthier lifestyles, better weight management and less metabolic syndrome. Fermented yogurts exert the strongest effects on cardiometabolic inflammation and intestinal inflammation in mice. Research is needed in humans. Future research will focus on metabolites from yogurt ferments In Vivo and in animals while focusing on impacts on cardiometabolic disease in humans. Randomized Clinical Trials are required to prove “Cause and Effect” of yogurt consumption benefits, independent of other accompanying lifestyle choices.